Burberry Sport for Women is dedicated to a young and modern woman. 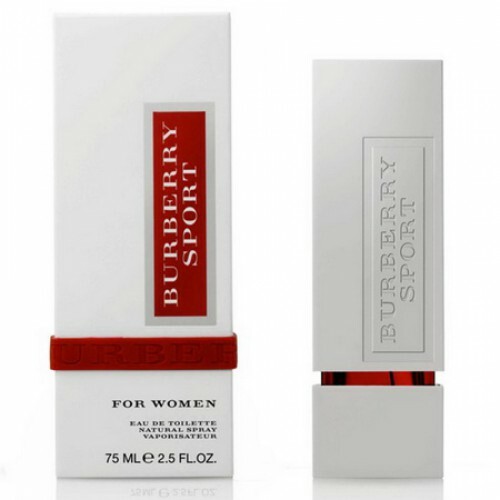 Burberry Sport for Women Eau De Toilette 75ml. - A water bloom young and fresh story Fresh, flowery, light, Burberry Sport for women is dedicated to a young and modern woman. Launched in duo, the fragrance follows the trend 'sports' found in men's fragrances. Easy to carry, with a spirit tonic, the scent is presented in a bottle modern and trendy. A red rubber bracelet and detachable labeled Burberry adorns the case. This fragrance is released in France in 2010, is the epitome of a certain charm the world capital of fashion and noble traits embodied by British designers. Sport for Women is a perfume created in the best European tradition. It is designed for women who lead an active lifestyle, who are not used to sit on the ground. However, no matter what they were doing at the same time look perfect as a true lady. Such is the flavor - surely on the verge of dynamism and elegance. scented water in a dignified manner intertwined bright charm and femininity, rich fragrance and durability. It gives its owner a magnificent floral fragrance, sounding the rhythm of active fervent mood. Composition Sport for Women was created with all the rules of the art of perfumery. The top notes of sparkling cool sea breeze thanks to the harmonious combination of mandarin and sea salt. In the notes of the "heart" colorful tones bitter-tart chord. Base notes of a symphony relieve stress and allow you to enjoy the ordinary moments of life.